Motivated by a lecture, guest writer Vicki Dawson, realises a dream by climbing one shallow breath at a time to Everest’s Base Camp. 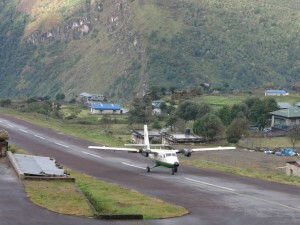 Day 1: After much giddiness (me) and flicking of switches (the pilots) our very small plane took off for Lukla. 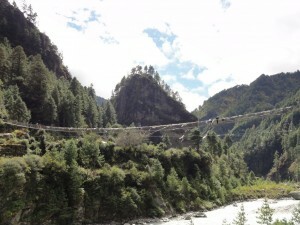 Immediately the breathtaking beauty of the Himalayas revealed itself; the huge mountain ranges dominating the skyline. I could hardly believe that my dream was finally coming true …. except it wasn’t. Only 10 minutes out from Lukla the mountain mist descended and the plane was forced to make a U-turn back to Kathmandu. What I didn’t know at the time is that Lukla is considered to be one of the Top 10 most dangerous airports in the world because planes have the tricky task of landing between two mountains on an uphill runway. All I knew was that I felt cheated at having to spend another night in Kathmandu, not to mention, a little anxious about whether we’d be able to start the trek the next day. It’s only when you reach Nepal that you realise that no matter how much you plan, you are at the mercy of the elements. It’s then you start to understand the challenges faced by the brave people who reach the summit. In fact, it was one of those people who inspired me to make this journey: Rebecca Stephens – the first British woman to climb Everest. I was fortunate enough to hear her speak about her incredible journey to the top; it was her talk that moved me to make my dream a reality. Day 1 (Take Two): Thankfully the weather cooperated the next morning and we made it to Lukla, an unattractive town that immediately assaults the senses: the noise upon exiting the airport as a crowd of Nepalese vie for your attention in hopes of getting guiding or portering work; the smell of smoke rising from the guest houses; the tip tapping of the zopias (cow/yak crossbreed) on the cobbled streets and prayer flags flapping in the wind all combine to create a lasting impression. After a hearty breakfast of porridge, the adventure began! Dropping down from Lukla the trail meandered up a lush green valley along a river, through small villages with tiny makeshift houses and past quietly spinning prayer wheels. Dirty faced children slid down a large stone, giggling and running back to the top to take their turn again. Vegetables were growing in small gardens and chickens picked at the bare earth. There was a strong scent of flowers and the only sound was the chit chat of trekkers making their way along the trail. It was one of the most peaceful places I’ve ever been and I was almost disappointed when we stopped for the day. However, the group bonding that evening, as we sat drinking endless amounts of tea, was the most fun I’ve had in a long time and set the tone for the great companionship we’d share throughout the trek. Day 2: Setting off for Namche Bazar, a large town situated at 3,300 metres, we continued up a valley, traversing several suspension bridges crossing the foaming glacial river which ran down from Mount Everest. The bridges swayed ominously and when you met yaks heading towards you mid-bridge it was a case of clinging on for dear life and not looking down. 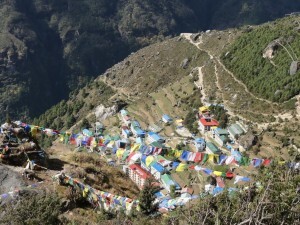 The climb to Namche is the steepest climb of the trek and the first real taste of the effects of altitude. It was slow progress and at times it felt like I had no breath; like there was a tight band around my lungs. It was a struggle to concentrate on breathing and not hyperventilate. When Namche finally came into view, with its shops and guest houses clinging to the steep hillside, it was a welcome sight. The last town on the Everest trail, it is the final chance to buy anything you might need, have a hot shower and use western toilets. From here on in, bathing opportunities would be limited and squat toilets the only choice. Day 3: A day of acclimatisation around Namche, it started off well when the clouds parted and we were greeted with our first sight of the mighty Everest. I’d expected to see a tall triangular, solitary mountain and therefore was a tiny bit disappointed to see only the tip of Everest poking out of the mountain range. However, I later realised that at such a distance it’s difficult to get the real scale of the mountain. After our brief Everest excitement we climbed 400 metres. It was hideous. Wheezing and gasping as I breathed air with only 64% of the oxygen found at sea level, I was glad to arrive 45 minutes later at a small tea house. To celebrate, I ordered a large flask of hot chocolate, only to be rewarded with something that tasted more like dirt than Cadburys – I don’t think it will catch on! A little wiser, before leaving Namche I stocked up on essentials: loo roll, as I was convinced that I would become victim to the raging trots at some point, and emergency chocolate (Cadburys) in case I encountered any more dirt-tasting chocolate. . . I also had my first ever Skype experience in a small internet shop – my parents were so thrilled to hear from me that Mum gave Dad the phone in the shower! Unfortunately, the effects of altitude were already beginning to reveal themselves. As a result of taking the Diamox, I started experiencing tingling in my fingers and toes, HAFs (high altitude farts – a lovely side effect), along with a runny nose, increased urination, strange dreams and a dry mouth due to reduced moisture in the air. 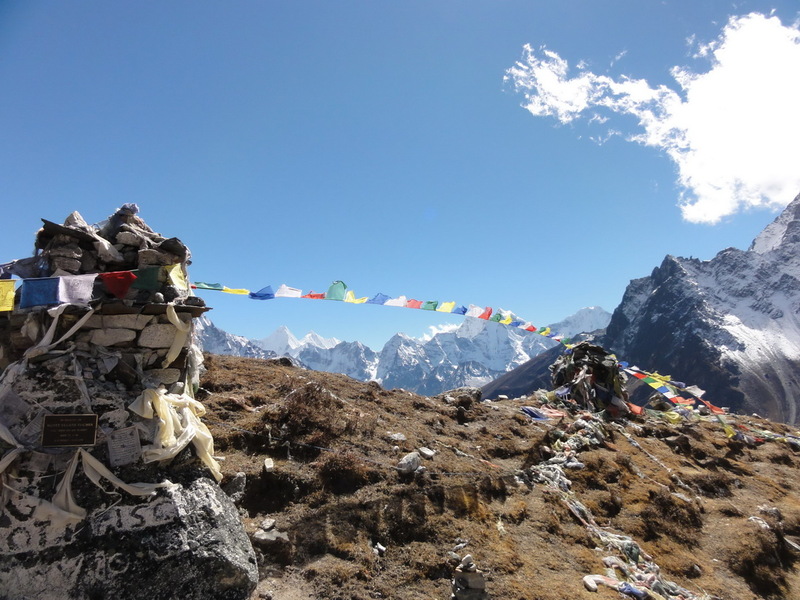 Day 4: We set out along a winding trail perched high on the hillside with a dramatic drop down to the river on the right hand side, with the peak of Ama Dablam rising above to the left, and flapping prayer flags lining the route. The tranquillity of the trail was broken only by the cry of ‘Yak’ – which called for the immediate flattening of oneself against the hillside to avoid being run over by a yak train, as several heavily laden yaks swayed past, bells clanking. 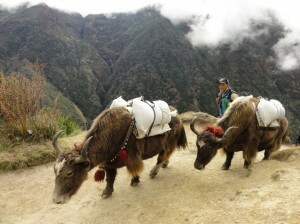 I loved the yaks, they are amazing creatures: carrying heavy loads up and down the mountains; their wool used for clothing; their meat for food, their milk churned for cheese and the piece de resistance, their dung used as fuel. The Nepalese collect fresh dung which they flatten into patties and leave to dry in the sun. It’s then burnt on the stoves, providing warmth and acrid smoke in the trekkers’ tea houses. Ending our day in Phortse, we were thrilled to be staying at a lodge owned by Sherpa Karma Rita, who’s undertaken numerous expeditions to Mount Everest and summitted an amazing five times. 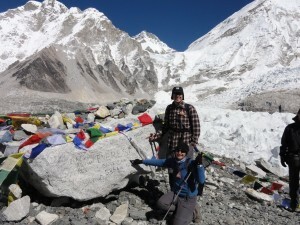 Oh, and he’s also finished 2nd in the Everest marathon – which he cites as his proudest achievement. He was amazing – incredibly humble, fetching water for the makeshift shower which involved a bucket of hot water and a little plastic shack outside, and serving food & drink to us. 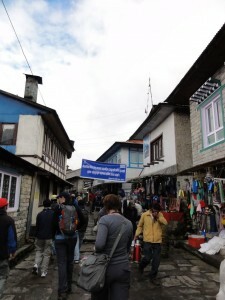 The village is home to many Sherpas, and surrounded by mountains it’s a perfect place to learn the trade. 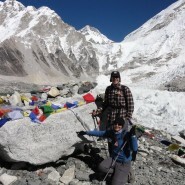 Being a Sherpa offers great rewards for the Nepalese. For Karma Rita, being a Sherpa provided financial security for himself and his family, enabling him to build the Lodge. It was a true honour to meet such a brave man. Day 5: Despite the stunning scenery, it was a tough morning tackling several steep sections before lunch. For the first time thoughts of giving up crept into my mind when, bent double over my trekking pole, I was overcome with a wave of stomach cramps. Arriving at our lunch stop, half the group immediately fell asleep, but hunger and a bad headache (another high altitude delight) kept me wide awake. In the afternoon, passing 4,000m and climbing above the tree line, the landscape started to change. We were surrounded by a rugged landscape dotted with a few gorse bushes. With its promise of ‘home comforts’ in the barren landscape, the tea-house was a welcome sight that evening. Day 6: Another acclimatisation day which offered a chance to explore this new landscape, we climbed to Ama Dablam base camp. The steep terrain combined with the altitude made for a tough climb and it was with a real sense of achievement that I stood at the top and breathed in the beauty of the mountain range which enveloped me; Island Peak, Lhotse and Ama Dablam. After treating myself to a strange tasting bit of Dairy Milk (another altitude effect) I helped build a prayer tower, reverently placing my stone onto those of my companions and praying for a safe trip. 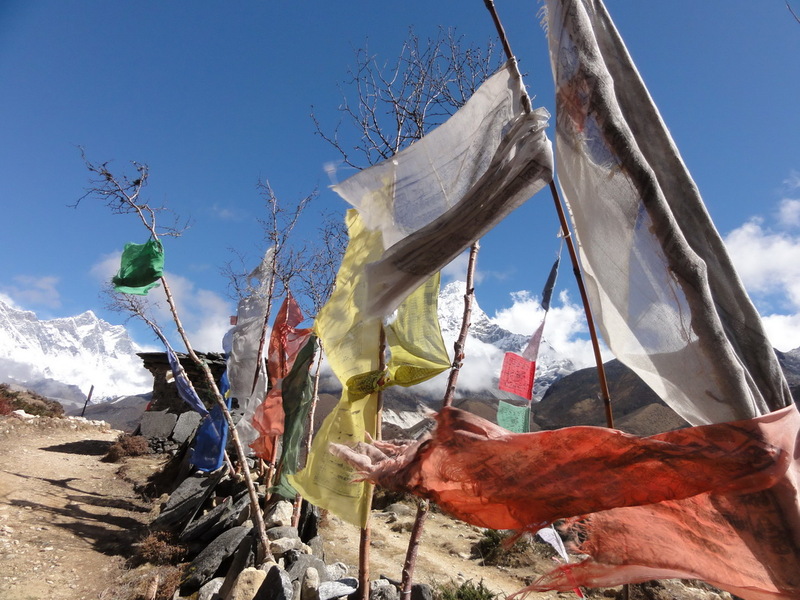 Here in Nepal you feel closer to the Gods, its hard not to with the many prayer flags and wheels that you pass on the trek. Unfortunately, the much-feared raging trots took hold, along with nausea and a general feeling of being under the weather. Most of the group were similarly affected. However, we considered ourselves comparatively lucky: Another group had a member in advanced stages of altitude sickness who was refusing treatment and would be dead within 24 hours if he stayed at altitude. It was a chilling reminder as to how dangerous the effects of altitude are. A fact compounded the following day when we reached the memorials for climbers who have died on Everest expeditions. Here, the names of the brave are captured forever amongst handmade stone pinnacles and the ever present prayer flags; it’s a very moving and humbling sight. We continued on up the valley, the mountains rising high and wide to our left and right, the road flat and bare in front of us, with only the odd boulder breaking the bleakness. Arriving at Labouche, our last stop before heading for Base Camp, the effects of altitude increased – stomach cramps, a high resting heart rate, a dry hacking cough (Khumbu cough) along with lack of concentration and loss of appetite. A 50m height gain acclimatisation walk after lunch nearly finished me off. I struggled with the lack of oxygen and constant feelings of nausea. However, upon arriving at the top I was greeted with the sight of the glacier flowing down from Everest and the holy grail of Everest Base Camp shining in the distance. It was enough to keep me going, slowly putting one foot in front of the other – the prize of Base Camp driving me on. Day 7: Finally the big day arrived. With an 8.5 hr trek in front of us I set off with a mixture of excitement and trepidation. Through my three layers, down jacket and gloves I could still feel the chill wind in my bones and the thin air left me gulping for breath. Credit goes to one of my travelling companions who dropped back and walked with me to our first tea stop for keeping me motivated. There were many times on the trek where we were so reliant on each other for morale support that I considered myself to be very lucky to be with my group. We were determined to make Base Camp as one. 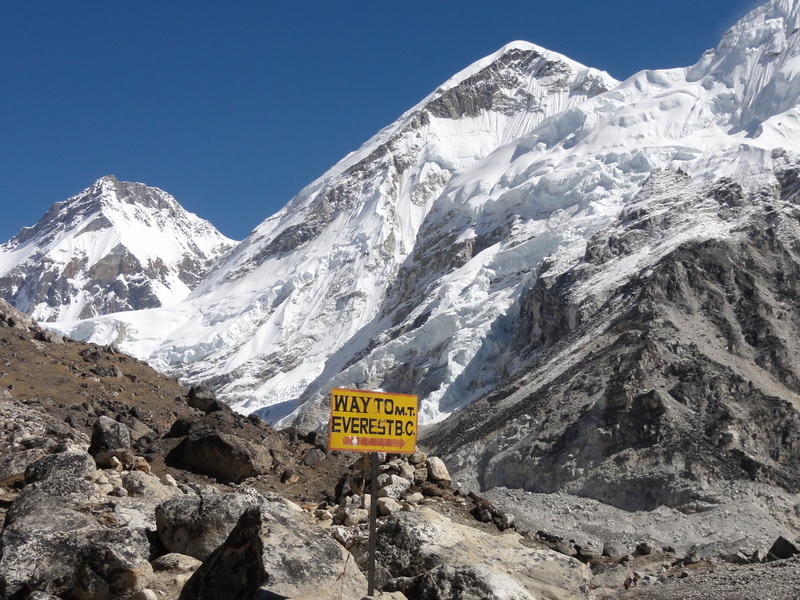 Heading into the final stage of the walk, the route along the undulating path is pretty hard going, however the sight of Everest’s summit above and Base Camp below, seemed to ease the passage. Encapsulated within the sweeping snowy mountain range the landscape is almost lunar in its appearance, with large grey rocks and dust as far as the eye can see. As we walked along I heard a distant rumbling which at first I thought was an aeroplane but then realised that it was the sound of hundreds of tonnes of snow sliding down the mountain in an avalanche. When we started descending into Base Camp (I wasn’t too happy knowing I would have to climb back up) I almost wanted to run the final few metres to reach my goal that little bit quicker and savour my achievement that little bit longer. Reaching Everest Base Camp, I was elated; revelling in my achievement before being overcome with the emotion of the journey. Although it is little more than a flat rocky plateau with a large rock announcing it as Base Camp, for me, it was about what it stands for. Here the journey really begins for the many who risk their lives in pursuit of a dream to reach the top of the world. 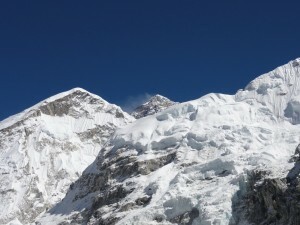 Standing in the camp, with the Khumbu icefalls and the trail onwards to 1st base before me, the majesty of Everest resounded throughout my every sense. The beauty of the mountain before my eyes, the taste of dust in my mouth, the deafening silence punctuated by an avalanche and the very thin air (now only 50% that of sea level) drawn in through my nose. I’ll remember that moment until the day I die. After a celebratory yak cheese sandwich, some sweets (a very thoughtful gift from a friend I carried all the way from home), lots of photos, hugs and a medal giving ceremony from one of our companions who had crafted individual medals for our group, it was time to leave. Ten days walking for 30 minutes at Base Camp. That’s all you get. Day 8: For reasons unknown, I decided to get up at 4.30am to climb Kalar Pattar. This peak offers a legendary photo opportunity of the sun rising behind Everest and so with two pair of socks and several layers of clothes, I was one of seven (from our group of 12) that set out into the -10c morning. It was a wonderful sight to see the mountain range lit by moonlight, the night sky clear and the stars shining brightly but that was about as good as it got. The climb of 2km with a height gain of 400m was non-stop steep, and the fight for breath was one I felt like I was losing. The cold seeped into my bones and I lost the feeling in my fingers and toes after only 30 minutes. Two of the group made the sensible decision to turn back, but I doggedly persisted, inching my way upwards as night turned to dawn and the sky started to lighten. Finally, after two hours I reached the top and collapsed into a sobbing heap. This climb had broken me and I have to confess that I used up all three of the cries I had allowed myself, for the entire trek, in that one morning. It was bitterly cold at the summit and there was no respite from the chilling wind as we waited for the sun to take its place for our photographs. I never got to see it though, following a particularly bad attack of the Khumbu cough, nausea and mental confusion I admitted defeat knowing that I urgently needed to get down from altitude. Leaving my camera with my partner I made my way back down the mountainside, towards breakfast, warmth and more air. Day 9 & 10: All that was left now was two days trekking back to Lukla where our plane to Kathmandu awaited. The way down included a trek through ‘windy valley’ (it was) and a visit to the highest monastery in the world at Tengboche, where the monks wear hiking shoes and down jackets. Oh and if you’re ever passing by they have an excellent bakery that serves Lavazzo coffee. As we descended the scenery reversed with the bare landscape giving way to lush valleys and soon we were back at Namche for our last stop before Lukla, where I was disappointed by a lukewarm shower. Before we knew it, the group were back in Lukla in accommodation so terrible that I was overjoyed the next day to wake to the sound of planes taking off knowing that I wouldn’t have to spend another night here. So with a sense of happiness I said a fond farewell to Everest and climbed onto the plane. I left Nepal two days later, weighing 3.5 kilos less than when I arrived, with several new friends, lots of mementos and memories which will last me a lifetime. As trips go, this one will be hard to beat. Wow, that was an incredible story. Thanks for sharing your experience.